How do I add my articles from PubMed / MEDLINE to my publications list? The publicationslist.org site now includes an integrated PubMed search interface so once you have registered you can click the 'PubMed' link to search for your articles on PubMed / MEDLINE, select the ones you want to add, and all the details including abstract and keywords (including MESH terms) will be added to your list. How can I keep my publications list up to date? Can I get email alerts when my new publications are added to PubMed or MEDLINE? 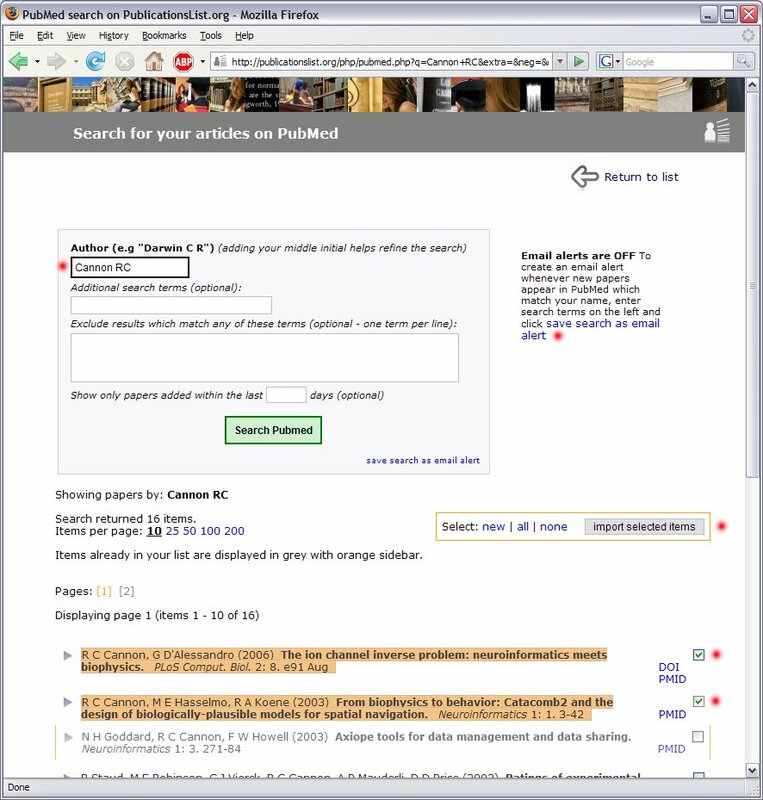 The search page includes a link to 'Save PubMed Search as Email Alert'. This will send you an email notifying you whenever new papers matching your name have been added to PubMed. You can then follow the link in the email and select which publications you want to add to your list. An email will also be sent when your PubMed entries are fully indexed for MEDLINE (i.e. they have been checked by curators at NCBI and standard medical keywords added). By default the search will be by author name (surname + initials). If there are other authors with the same surname and initials, you can add additional search terms to include, as well as negative keywords to exclude. Advanced PubMed users can refine the search using PubMed field-specific queries, e.g. one can exclude or include results matching the pubmed affiliation/address field "AD" by using a term such as "Cambridge [AD]". Can I import a citation just using the PubMed ID? Or by pasting the PubMed XML file? Both of these are also possible - on the 'add a paper' page there is a space for entering a PubMed ID or pasting a PubMed XML file (available from the PubMed (NCBI / NLM / NIH) website using 'view results as XML'). Most people will probably find it simpler using the integrated search interface. Firefox users can also use the HubMed search interface. Publications on PubMed often appear initially ahead of print publication, without complete citation details (e.g. missing page numbers). They are later fully indexed for MEDLINE with MESH terms etc. How do I make sure the publications list is fully up to date? When you set up email alerts for PubMed notifications, as well as checking for new publications which match your name, it will check if there are updated versions of any citations which you added before they were fully indexed for MEDLINE. You can then add the latest versions to your list, and the extra keywords and updated citation details will be merged in.